Here is my latest acquisition from Ebay. 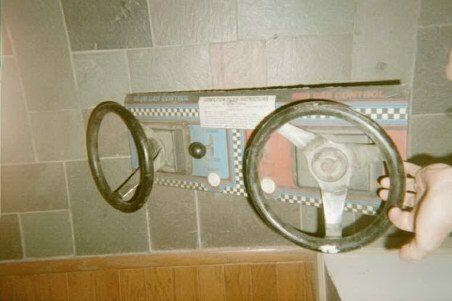 Its an authentic steering wheel assembly from a Demolition Derby game. All the way from Canada! I have cleaned it up and attached it to a stand. 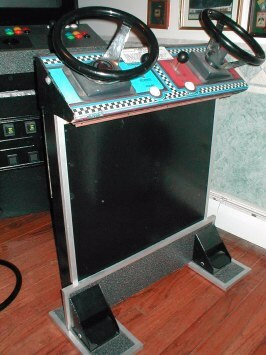 I have acquired an Opti-Pac from England and connected both steering wheels operating for side by side racing. I was also able to obtain 2 Happs gas pedals from Ebay for an incredible price. See the photos below. Here is the rear of the steering wheel control panel. I obtained 2 Happs optic encoders which read the position of the cursor (or car in this example) from the teeth in the large gear moving through it. The same way a mouse does. Steering wheels are complete. I built a stand for them with a 2x4 frame and 1/4 inch hardboard for the front, sides and rear. 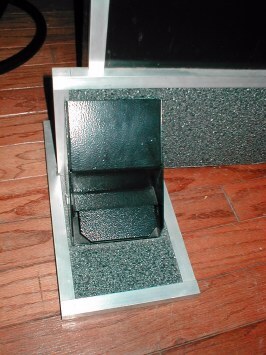 I had some 3/4 inch thick 90 degree angle aluminum from an old project, and used it to cover all the exposed edges. I attached it with silicone, stuck on their well. I wired it all up to a 25 pin parallel printer cable. 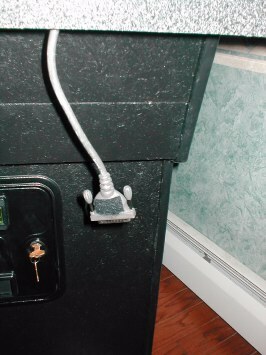 It's connected to the Opti Pac, so it can be connected and disconnected, without shutting down the computer. I attached industrial strength Velcro to the cable, which allows me to stick it to the underside of the control panel when we are not using it. The stand is heavy, and I was going to make a Velcro strap to attach it to the control panel, but with the weight it wasn't necessary. Below are some detailed photos of the Steering wheel stand. Here is a photo of the completed steering wheel project. 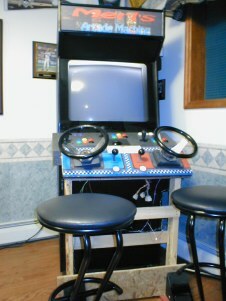 I obtained the steering wheels from Ebay from an old Demolition Derby Game. The gas pedals are Happs pedals also obtained from Ebay. 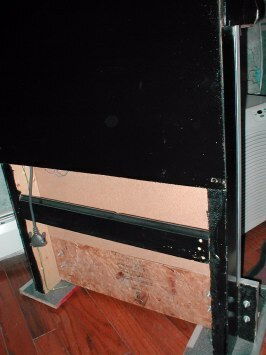 The panel is attached to the wooden stand with a nut and bolt on either side. I have felt pads on the bottom so it slides easily across the wood floor. Here is a close up of the gas pedal. You can also see the detail work of the angle pieces of aluminum I used to cover the edges. Here is a photo of the rear of the steering wheel stand. It's 2x4 framework with 3/4 inch plywood for the lower pedal assembly. Then for cosmetics I attached 1/4 inch hardboard to the front and sides. 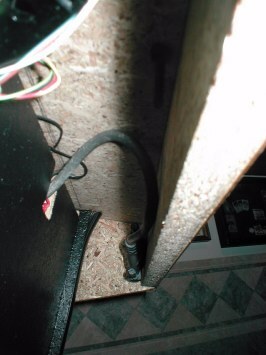 The wires are stapled to the wood and the parallel connector is visible as well. 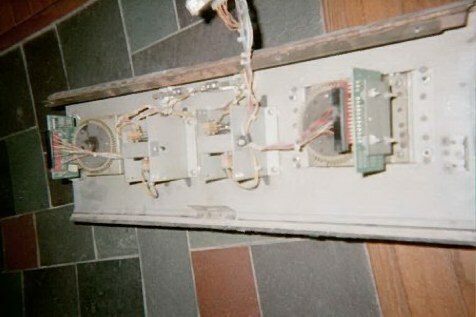 Here is the underside of the control panel. I have the other end of the parallel printer cable attached with Velcro. It's very accessible and then hides away from harm, when not in use. This is the parallel printer cable with the Velcro attached. The optipac is a hot swap device, so I don't have to shut down to add or take away the steering wheels while gaming.